Date: June 15 2007 Time: 02:00 a.m.
A six year old girl told her mother that she had had a nightmare during the night. She told her mother that she had been in a room with a giant “hornet”, but it wasn’t a hornet but more like a mixture of a cricket and hornet. “Like a praying mantis thing, but taller.” She also said that there were other creatures “shorter, like three and a half feet tall.” These didn’t look like insects but didn’t look like people either. She described them as having very black eyes. She also noticed that the shorter creatures were wearing shoes/boots “like the kind a basketball player wears.” She recalls lying down while they put some sort of tube or instrument in her ears, she also said that it was the reason for the “bad taste in her mouth.” At this point she started to resist and she said she fought off two of them, and then woke up on her bed. 12-year old Paul Nelson (pseudonym) was visiting the island with his parents. Also along was Paul’s best friend, Michael. The two boys decided to go inside their boat and read some new comic books. Suddenly, however, they both experienced an episode of missing time. Their next memory was of waking up the next morning. While Paul was unable to convince his parents that anything unusual had happened, both Paul and his friend knew that the event was strange. Two weeks later, Paul was alone in his Reseda California home when he had another strange experience. He was alone in his room when the door began to rattle. He jumped up and threw it open. To his shock, he saw the shadow of a small figure running down the hallway. He chased after it, but found nothing. Paul didn’t know how to explain these experiences and didn’t connect it to the UFO phenomenon. Many years later now married and a doctor Paul underwent hypnosis to recover his lost memories. As Paul underwent regression, his first surprise was that he was not aboard a UFO, but instead appeared to be in underground base. Paul says he was taken to a round walled room. It seemed to him that it was more of an underground facility than onboard a ship. The walls had kind of rock-like facet to them. And he was lying on a rock-like table. It gave the impression that he was in a cavern rather than in a ship. Under hypnosis Paul recalled his friend Michael nearby, also being examined. His next surprise was that the beings were not what he expected. The beings were not the “typical” grays; they were more like the “Praying Mantis” type. 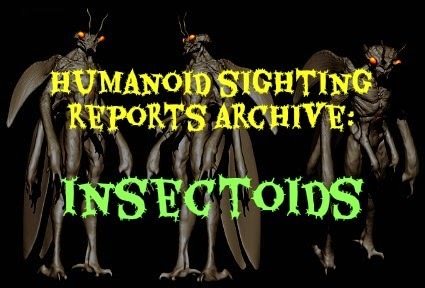 They were slightly bigger than the grays and a little more Insectoid-like. They wore tight-fitting uniforms. There was even a color to them but he couldn’t recall what the color of the tight-fitting jump-suit like things. He thinks that there was one in the group that wore a tunic-like outfit, more loosely fitting over it. He couldn’t tell how tall they were since he was lying on his back. But they didn’t look particularly tall. A 23-year old woman was camping in the area and one evening was walking along a forest on a long meadow on her way to her tent when she noticed a bizarre creature standing by a nearby lake. The creature made a movement as if picking something up from the ground. It then apparently heard the witness approach and quickly disappeared from sight. The witness stood literally petrified as she watched the creature standing only 8 meters from her. She feels that the creature was also frightened. She described the creature as resembling a large insect (mantis?). Its face was long and thin, its body very thin and subtle and it was about 1.6m tall. Its skin was gray or beige in color. It also had something resembling long and narrow insect wings. Its eyes were large and dark, insect-like. The eyes terrified the witness. “It gazed at me and I knew that it did not know what it would do. Our encounter had no meaning or aim; it appears to have been a total surprise for both of us.” The witness stated. The witness states that she has witnesses numerous other strange phenomena since that particular encounter. (No details on that yet). The pregnant witness was on her way to see her doctor and was on a well-traveled road when she happened to glance up at the sky and saw a huge purple moon like object. She pulled over to get a better look. The object then seemed to fade out and became another color. It turned from purple to blue, green, orange, and silver. It kept spinning and fading out. Next thing she knew she was at her doctor’s office at 1930. Her face had acquired a suntan like burn. Years later under hypnosis she was able to remember more of what had happened. Apparently she was taken inside a craft in what looked like a large eye that opened up under the craft. Inside she was in a small white room, where she was pushed against a wall by a creature resembling a “praying mantis.” There was a metallic slab behind her. Two short white pale creatures with large black eyes then dressed her. She was told that she would not be harmed, apparently by telepathy. A reptilian like creature now entered the room. She was then led through the craft when she passed a black room, she felt that it was not a comfortable place to be, she also passed a gold room, she wanted to go there but was told she was not ready. The next room was small and pale pink in color; the room contained 20 incubators, 10 on top, and 10 on the bottom. She was shown what appeared to be Petrie dishes with embryos. In the 20th incubator she saw a baby with a very large head with aqua colored slanted eyes. His hair was very sparse. The witness felt an immense love towards the apparently hybrid baby. She was then led into a pale blue room. There she saw 20 more incubators, there appeared to be creatures resembling tadpoles in these Petrie dishes. Each incubator had a fetus in a more developed state and when she looked into the 20th incubator she saw a baby reptilian like creature. The whole time two short pale creatures and a tall reptilian accompanied her. Later she was led to a pale yellow large room resembling a courtroom. It was very misty inside. At that point the reptilian creature left her side. She was then led to the front of the room by the two short pale creatures. She then saw seven beings all wearing cloaks. One looked human, one alien, and one was tall, good looking of Nordic appearance that seemed to be the leader. He told her that she was judged, tested, and passed. She had no idea what he alluded to. At one point she looked at the Nordic humanoid at an angle, and he looked like a hologram. Then she noticed what appeared to be a small thin wire going into her arm. She heard strange sounds and the tall blond humanoid told her that they had given her knowledge and she would know what to do when the time was right.